A blue 16 inch bowed lamp shade that is part of a matching range of lamp shades styled in the classic Empire design, with a contrasting edging in a range of sizes from 5 – 22 inches. This wonderful pastel coloured sky blue lamp shade is fully lined and is made in a mock silk fabric with a matching trim. The 16 inch shade is the perfect size shade for the larger table lamp. Height 12 inches. The 16 inch shade requires a shade carrier or gimble. 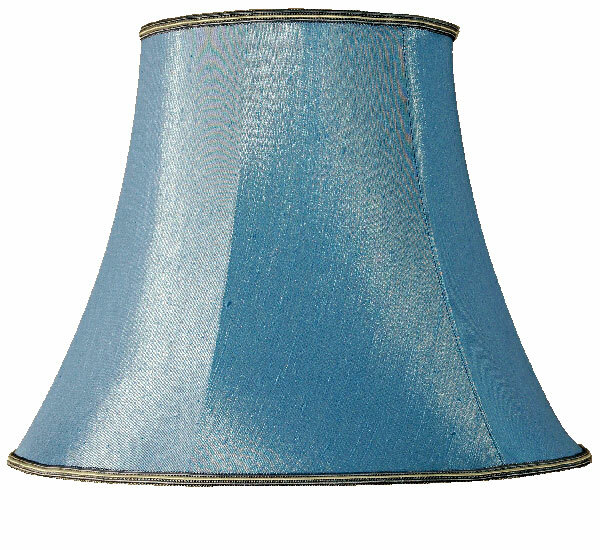 Blue Bowed Empire 16 Inch Table Lamp Shade, Unlikely, given the name but does this come in dark red? We are able to supply this shade in a “wine” colour, which is a deep red. Please contact a member of our sales team who will be able to show you the colour.